It’s soup weather and this Coconut Curry Cauliflower Soup is just the ticket to warm up your soul on these chilly winter days! Not to mention it’s super quick and easy to make. Double win! The awesome thing about this soup, besides being a cinch to make, is you can add all sorts of veggies or protein to it. I chose to keep it simple and used roasted shrimp with mine today. You could use chicken if you want, or no fish/poultry if you want to keep it vegetarian (use vegetable broth instead of chicken in that case). I also think the addition of potatoes or baby corn or carrots would be absolutely delicious in this soup. Whatever you’re in the mood for. It’s a very adaptable recipe! And…while I’m not an expert, I believe it fits into a low carb lifestyle (if you don’t add the coconut sugar). I love curry paste from Mae Ploy . I have their green, red and yellow in my fridge. This recipe uses the yellow curry paste. The only other ingredient you may not typically have in your pantry is a can of coconut milk . Other than that, the recipe basically just calls for onions, garlic, stock, and cauliflower. I also added a bit of coconut palm sugar because I think it needed a touch of sweetness to balance it all out, but that’s optional. Just give it a taste and adjust as you like. Then just blend the soup to puree it. I use an immersion blender which is so much easier than blending soup in a blender…and safer too. Hot liquids in a blender can explode so you have to blend in small batches, or let the soup cool down. 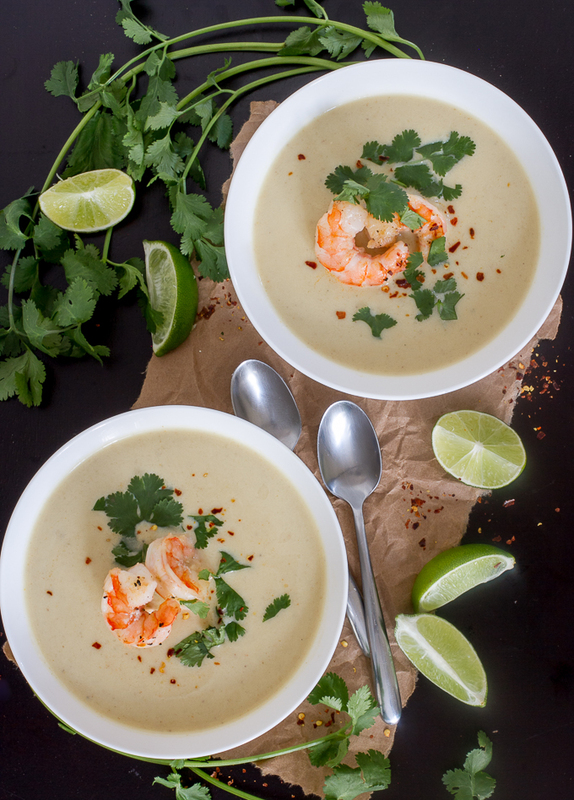 I loved this coconut curry cauliflower soup with shrimp that I roasted in the oven, some chopped cilantro and a sprinkle of red pepper flakes. I like things spicy…but if you don’t, leave it off! I’m pretty sure if you like Thai food you will love this soup. I know both my husband and I did. 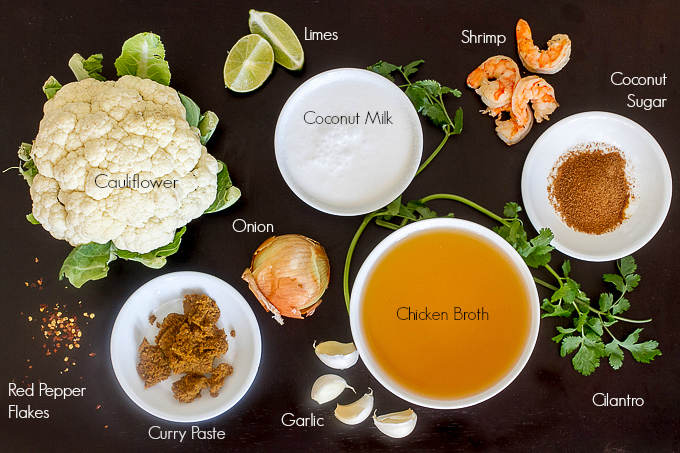 So give this Coconut Curry Cauliflower Soup a try…and if you do, come back and let me know what you added to it. I’d love to hear! 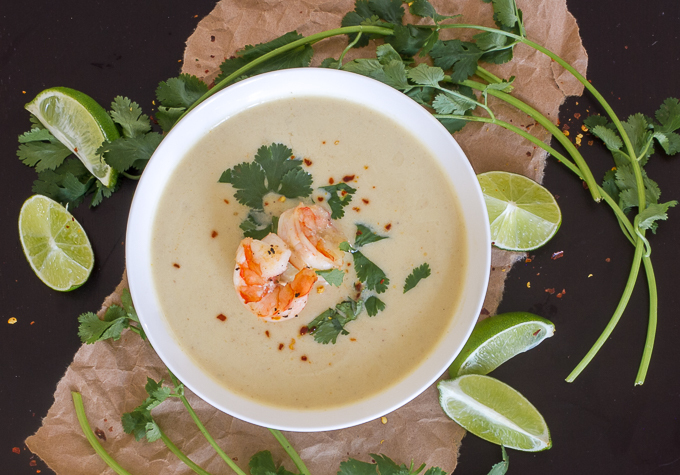 A simple, delicious Thai flavored soup with coconut milk, curry and cauliflower. Easy to add your favorite veggies or protein. In large soup pot, heat butter or oil. Add cauliflower, onions and garlic, salt & pepper and cook until they start to soften, about 5-6 minutes (depending on size of your cauliflower pieces). Be careful not to burn the garlic (you could add it after the veggies start to soften if you like). Once the veggies have softened, add the curry paste. Stir to combine well. Add stock and coconut milk. Stir well, and let it simmer 15-20 minutes for flavors to combine. Taste and add coconut sugar if you want. Puree the soup with an immersion blender until smooth. 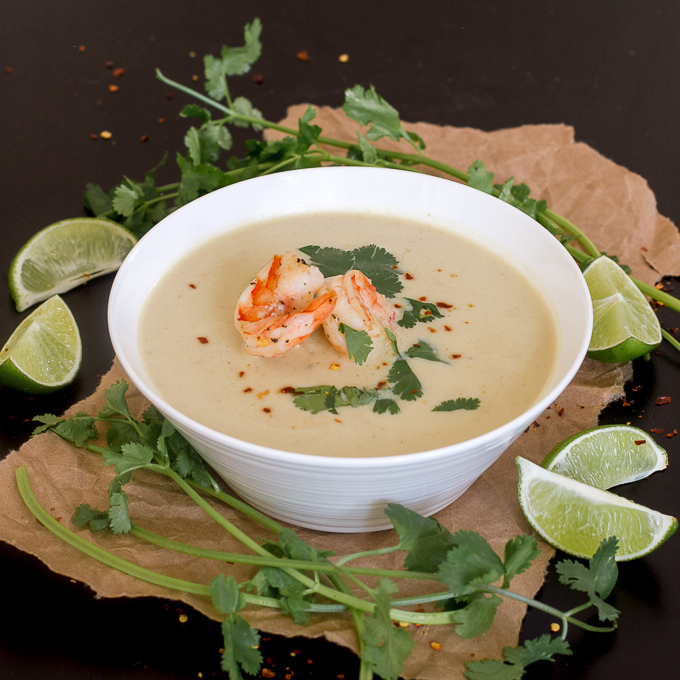 Garnish bowl of soup with cilantro, squeeze of lime, and red pepper flakes or chili oil, if desired. If you want to add potatoes or carrots, dice them into chunks and add with the broth, simmer until potatoes are tender. If you want to add baby corn, just drain and rinse them from the can, dice into bite-sized pieces and add while the soup is simmering to heat them up. If you want to add cooked chicken or shrimp, add it at the end of simmering to heat it up. I like to roast shrimp in the oven. Just toss shelled shrimp with a little olive oil, salt & pepper and roast for about 5-6 minutes at 425 degrees. If you don't have an immersion blender, use a regular blender, just be careful with hot liquids in the blender, let the soup cool a bit. This is one of my favorite soups! I love the idea of adding potatoes and carrots to it. It’s perfect for this single digit and negative digit weather we’re having in Chicago. It’s been cold here in DC Linda…but not that cold!!! Yum! I love curry, this sounds great! YUM!! I like it. Might try it but without the shrimp. This looks delicious. Thanks for sharing the recipe with us. mmm sounds good and perfect for this weather. This soup looks amazing! Complex flavor with the coconut and curry. I’ll definitely give this one a try. Thanks for sharing your recipe at our Sunday Recipe Link Up Party. This sounds so good, thank you for sharing! Your pictures are amazing! I’m not a big curry person but I might just give it a try! Sound delicious – some chopped red/green peppers on the top might add an interesting splash of color. Thanks for sharing. Yes it would! If I had any 😉 Thanks for stopping by! I made this soup for the second time today. Absolutely amazing soup! Just make sure you use good quality thai curry paste – I tend to go to the Asian grocery stores for this. Thanks Judy for the wonderful, low-calorie recipe! So glad you like it… and I’m glad you wrote this comment! I have a head of cauliflower in the fridge with no plans for it. I think I’ll make this soup again!! !